This post will not be laid out in its usual formality but rather a mosaic style review over Peonie and Steph’s (@cameraeats1st) attendance at the Southbank Centre Food Market 1st birthday festival. Here’s a run down of what they ate! One of the main food markets, Southbank Centre Food Market, in London, recently had its 1st birthday party held on 1 April to an evening of festivities and most importantly food! Arranged by @katymarketfresh consisting of a series of well known Southbank Centre food traders, Sambal Shiok, The Hop Lockers and more. 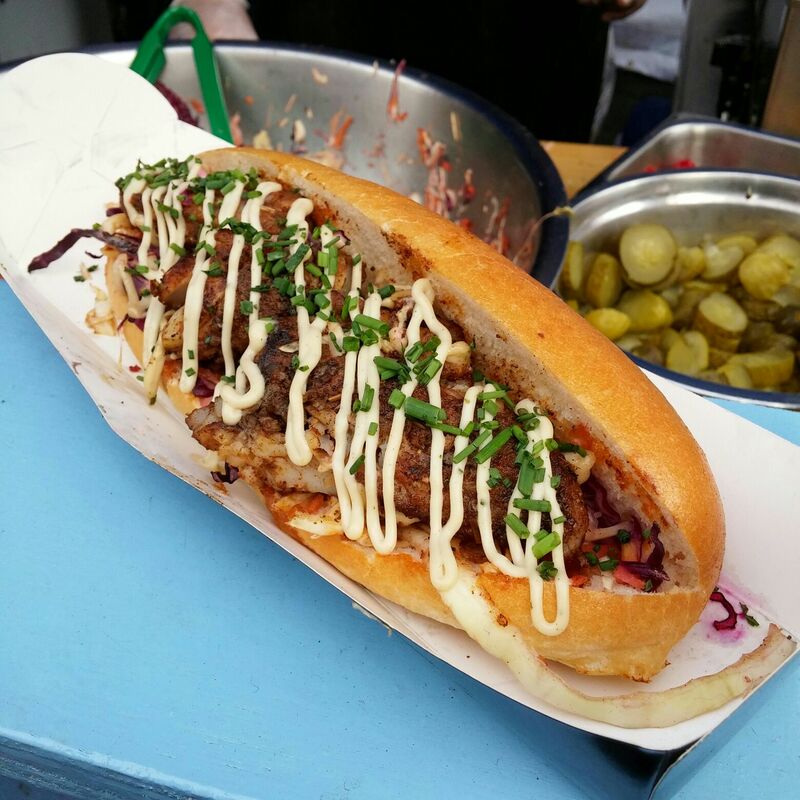 A well known food trader seen at Southbank and Kerb focusing on meat filled sandwiches with a New Orleans twist. Succulent, juicy and spiced up, you’ll be in for your treat with signatures such as their Cajun Crawfish Balls and a good bargain for money too. Established in 2008, Elephant Juice Bar has been prominent in the street market and music festivals scene, a stall not common amongst the heavy meat traders and burgers galore. 100% fresh ingredients with fruit and vegetables sourced locally. Makes a good refreshing drink after all the carbs and protein consumed on the day! Another trader no stranger to food markets, Horn OK please has established a reputation as one of India’s finest for its authenticity and contemporary Indian street food. A regular at Borough, KERB, Southbank and probably more. I first tried my first frenchie burger at Camden Market and was amazed how they can grill duck confit to something mouth watering. Brioche bread finishes it off in style – a must try if not had before. Plus you can’t go wrong with duck fat chips with truffle mayonnaise… my mouth is salivating already. Of course Peonie and Steph Y finished in style. Katrina cake slice is more than one’s fair share. An authentic American bake shop and cafe that occasionally appears in street food trading from time to time.